When you live in New York City, there are certain expectations of what you should be able to accomplish easily. You can get almost anything delivered straight to your doorstep, whether it be food, groceries, toiletries, or pot. But there’s one service that is still stuck in brick-and-mortar land, and to be quite honest, it’s shocking that it’s stayed offline and off of our doorsteps for so long: Dry cleaning. Sure, you can get a bag of clothes picked up, washed, and dropped back off, but there’s no service that aggregates all of your nearby dry cleaners and compares prices, available pick-up/drop-off times, and books it for you (Seamless-style). But no more — SpotlessCity is finally here. 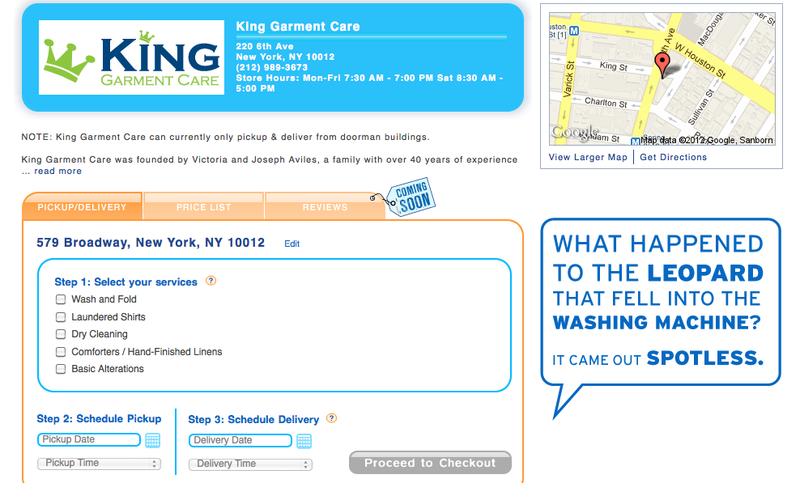 The service asks you to input your zip code and address, and automatically pulls in all the dry cleaners in your area. You can then enter in a pick-up and drop-off time, based on the dry cleaner’s availability, and that’s all there is to it. A delivery person knocks on your door, picks up your giant bag of wovens and delicates, and promises to see you again tomorrow (or whenever you have scheduled the drop-off). What’s better, perhaps, is that dry cleaners go through an almost identical process to end-users in terms of signing up and getting started. The dashboard can be accessed online, and now through a brand new iOS app that was just launched on-stage. SpotlessCity works with local dry cleaners to take a fixed percentage of all orders that come through the online service. Dry cleaning partners will not be allowed to mark up prices for SpotlessCity customers, nor will users ever be charged for pick-up/delivery or for the service as a whole. Most dry cleaners, especially in New York City, are small mom-and-pop shops that don’t have the resources to have a robust online presence, if they have one at all. SpotlessCity works as the middle-man to bring in new customers for dry cleaners and offer an easy, seamless method for getting your dry cleaning done. 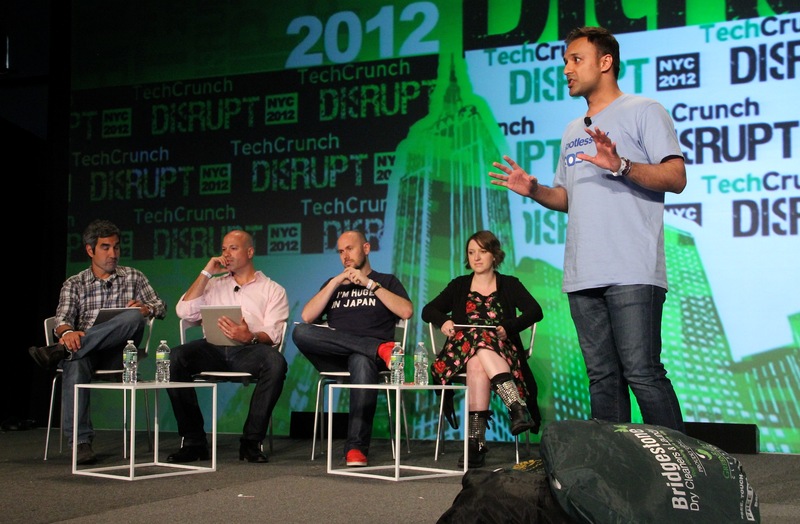 Founder Hissan Bajwa sees a bigger vision than “the Seamless of laundry” with this product. Along with providing an online platform to small dry cleaners, it’s worth mentioning that most people have no understanding of the various levels of pricing and quality at different dry cleaners. SpotlessCity will eventually offer an education to consumers, matching them with the right dry cleaner based on the type of clothing they wear. After all, a banker probably needs a different dry cleaner than a college student. 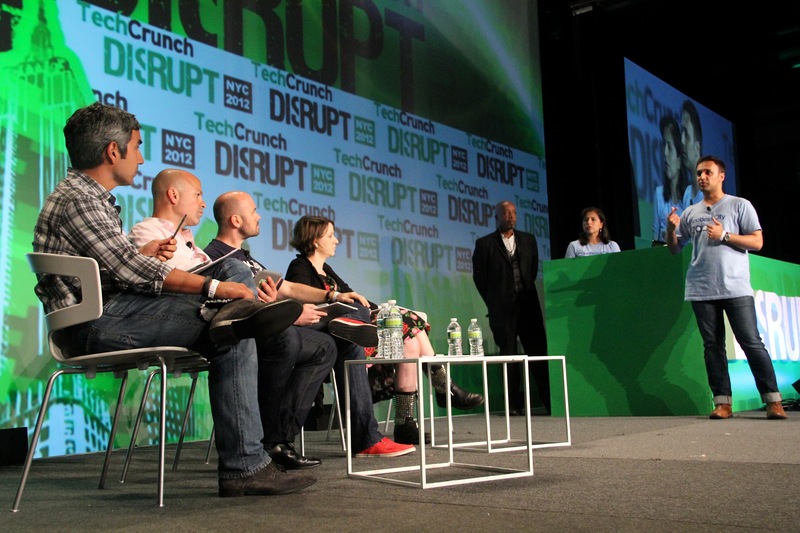 SpotlessCity has thus far raised a $200,000 seed round from friends and family, and is now launching out of the pilot phase to expand past Brooklyn and Manhattan into the other boroughs. Q: Can you expand this with other services? A: Yes we have plans to add services that are natural when you’re already shopping for a dry cleaner. Q: What is the problem that you’re solving for dry cleaners? A: When we talk to cleaners, they love the idea because in NY they have pick-up/delivery service. Phone is a noisy way to connect to customers and they want to get online because the phone takes time, people, and isn’t as quick. But since they’re small businesses they can’t build out that online platform with functionality. Q: In Open Table there are a lot of restaurants to go to, but with dry cleaning people just always go to the closest one? A: If you have a cleaner in your building, sure. But most people don’t want to lug around their stuff or get on the phone. Even in buildings with dry-cleaners, they may not like that cleaner. But they don’t want to shop around. Q: Have you checked out if it will work outside the city? A: Since we put up a beta site we’ve been contacted by dry cleaners all around the country. Right now we’re working on how to deploy to new cities, especially suburban cities that have a different delivery/pick-up model. Q: What is the rate that you charge from dry cleaners’ sales? A: We negotiate cleaners by cleaners. Our general rate is around 10 percent. Q: Then it would take a lot of transactions to break even? A: As we move into other cities we’re exploring more of a licensing franchising fee. Q: So what kind of volume do you need to break even? A: We have pretty good protections, and we’re on track to hit the volumes we need to break even. Q: How are you finding customers? Through salespeople or dry cleaners? A: Right now we’re very geographically limited. Three neighborhoods around town. So a lot depends on hyperlocal marketing. We have hit the streets, used refer a neighbor, and found that word of mouth has been great for us. Q: You say you’re like Uber for dry cleaners. Have you thought about launching other categories as well? A: We’ve thought about other household cleaning services. Things that make natural sense when you’re looking for dry cleaning. We want to focus on recurring services, so house cleaning. We’ve found that once people use SpotlessCity they keep coming back. Q: You’ve chosen to focus on convenience above all else. Is there a reason why you choose that? A: It’s still a bare bones site. We want to collect and add reviews but it needs to be done in a thoughtful way. If you’ve ever seen dry cleaners reviews, they’re often just rants. We need to keep them organized and meaningful, based on metrics so that they can educate consumers. Q: Are you worried this will only work in a high density city? A: We obviously want to deploy in similar markets like San Francisco, Boston, and D.C., but the encouraging thing is the fact that we’re getting contacted by cleaners in Denver and Miami. There is a marketplace there. It just has to be pivoted a bit for those markets.